When we are speaking to staff, we are often asked about common subjects. Here are some of the questions that we are asked frequently about purchase orders and invoices. There will be a list of exceptions to the No PO No Pay rule, this list will be a combination of specific suppliers and good/services which we would find acceptable not to require a PO. There will also be a process issued to deal with these. There are not any warnings regarding budget availability within the solution, however the BI Dashboard (Business Intelligence) can be set up to allow a live look at any budgets so they can be appropriately managed. We are currently establishing the process which will allow for internal trade to take place within the system, and to allow for the internal charge requests to be raised in conjunction with other tools. The current situation will not change in the immediate future. Procurement are liaising with our NHS colleagues regarding this. We hope these will prove helpful. We will be collating frequently asked questions on the other workstreams as they become apparent. If you wish any further information please contact us on business-transformation@dundee.ac.uk. You’ve probably heard about Change Champions, and you should know the change champion in your functional area. Change Champions are an essential part of any Change Programme. They are key people within each School or Directorate who act as a liaison between the Programme Team and their own teams. By communicating the aims, objectives and outputs to the end users in their business units/Directorate or School area, they are able to both raise awareness of the Programme and feedback the impact of the change to those who are responsible for managing it. Change Champions are positive about the change, they believe in the need for change and have the confidence to talk to their peers about change. They work with their teams to ensure they are informed and prepared for the change. You may see your Change Champion giving a short presentation at a team meeting, holding an information session or helping the Business Transformation team. They will be a useful source of knowledge about the Change Programme and will distribute information regarding this. Change Champions are integral to the success of any Change Programme and are immensely helpful to their teams. If you are interested in learning more about Change Champions please contact business-transformation@dundee.ac.uk. Author Posted on 7th June 2017 7th June 2017 Categories Change ProgrammeLeave a comment on What Is a Change Champion? 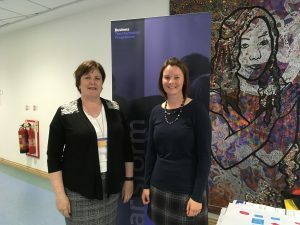 The team visited the Medical School at Ninewells recently, to talk to staff about the OneUniversity solution for Finance and Procurement and Research and Projects. To help explain the changes, the team have a number of charts that they can take users through, there is a presentation and short videos are available to explain specific parts of the process, in addition to key members of the Project Team on hand to answer more complex questions. The topics that proved of most interest were how to ensure that all costs involved in a research project are put against a project budget, how online expenses will work and details of the new online expenses system. “The Change Champions did a great job in ensuring that people knew we were coming along and encouraging them to take a look at the OneUniversity solution. Here are a few terms that you will see us using frequently when you hear us talking about key activities in Business Transformation. You will find more in the shared folder on box here. Solution Design Document In the preliminary stages, the SDD will scope the parameters of the project, in later stages it will detail how the various processes will fit together.